One alternative may be to develop a new JF-17 variant that does have enough range, payload and speed to effectively replace the Mirages. What I know is that the Block II have the AESA, and after 150 jets the 50 Block I will be upgraded to Block II. Block III will remain on the drawing board until the first 150 jets. The new platform to replace the Mirages will be a long haul twin jet. I read an article on Combat Aircraft that the BK2 will have the AESA, I asked around and was informed that AESA was the priority; let's see what they unfold. BK3 will remain on the drawing board for a very long time, until we are sure what are our future procurement needs. Somewhere along the line we incorporated the Exocets on the BK1, but still called it BK1. Edited by Felicius, 03 April 2014 - 02:02 PM. ^^ Well if that is the case, then it is doesn't add up. Since putting a new radar, and that an AESA, would require designing the nose-cone of the aircraft. Would also require to carry out tests to certify the structural integrity of the airframe vis-a-vis the redesigned nose-cone. Also, we would have had some indication of the AESA radar for JF-17 Thunders, where pictures would've emerged online, showing one of the prototype with the redesigned nose-cone. Air-Combat magazine is a reputable outlet for global Air Force's news. So it would be expected that pictures might start emerging of the Thunder with AESA, on a prototype. With respect to the F-16s. The aircraft is no doubt a very capable one with a proven track record. However, if you view the historical record of Pakistan Air Force, vis-a-vis F-16. I can say with certainty, that it is an aircraft which would be nice to have, provided America was a true ally of Pakistan and not one of convenience. The F-16s do enhance Pakistan Air Force's ability to conduct Air-Superiority and Air-Support missions. However, after experiencing two decades of sanctions and clinging on to the precious aircraft with dear life, due to lack of spares. I would find it irrational on part of Pakistan Air Force, to pursue an expansion of the F-16 fleet. Strategically, it's not a smart move to do so, unless of course, the balance of the fighter-jet fleet out-weighs the F-16's fleet with aircraft which are non-American. If Pakistan Air Force envisages a fighter fleet of 550+ aircraft. Then in such a case, 70-90 F-16s would be acceptable number to field. Which means, that the remaining fleet of Pakistan Air Force, would most likely be non-American aircraft. In the past three decades we have all witness, Pakistan Air Force has for the most part, opted to go the Chinese way. And since the JF-17 Thunder fleet is projected to be numbering around 200-250. That leaves them with at least another 90-120 aircraft to fill the void. Post 2002, Pakistan Air Force did figure in a reduction in the number of fighter-jet types it would operate. Pre-2002, they were operating 4 fighter types, which included F-16s, F-7Ps/PGs, A-5Cs and Mirage IIIs/Vs. And keeping this in mind, I doubt that Pakistan Air Force is looking to operate just two types of fighter-jets in the future. In this context, it is more likely that the third fighter type, would be the J-10Bs. And since it is mentioned in Alan Warne's book "Pakistan Air Force - A New Dawn" (by the former ACM of PAF) that there would be a phased retirement of the Mirages and F-7s. It indicates that there would be a third fighter type, other than JF-17s and F-16s. Even on a fighter for fighter replacement, the JF-17 Thunder will not replace the entire fleet of more than 300 Mirages and F-7s. The F-16s have never been percieved as a replacement of F-7s or Mirages, rather back in the 80s & 90s, Pakistan Air Force was looking to field 100+ F-16s for it's high-end fighter-jet fleet. As for the budgetary constraints .... Yes, Pakistan Air Force would most likely pursue a gradual restructuring of it's fleet. Which would lead to the conclusion that between 2009-2017, programs such as the JF-17s, F-16s, ZDK-03s, IL-76s and Erieyes would be the focus of attention for Pakistan Air Force. However, it wouldn't be unrealistic to speculate, that post-2017, an induction progam for a third fighter type, would follow. And that could very likely be the J-10Bs! Which gives them another 3 to 4 years before they would have to financially committ themselves to procuring, inducting and having the aircraft ready for active duty. And is a pretty conservative estimate, considering the current geo-political climate in and around Pakistan. In fact, it's even possible, that depending on the health of Pakistan's economy, that we wouldn't see the J-10Bs in Pakistan Air Force, before 2018/19. In my opinion PAF will go for a 5th generation platform instead of 4th generation platform like the J-10. A Gen-5 fighter is the eventual route that Pakistan Air Force will be embark upon. But that is not any time soon, as the development continues for the Shenyang J-31s. It would take another decade before Pakistan Air Force recieves it's first stealth fighters. The stealth aircraft will undergo a very detailed and comprehensive development, test, data-analysis, modifications and evaluation of it's components, before it ever goes into serial production. There will be years of test-flights, avionics and sensors integration, evaluation of the aircraft's stealth capabilities. Not to mention, that China itself will be procuring J-31s themselves and that too in significant numbers. It would also mean that the manufacturing facilities would be built to accomodate the demands. But those would be the demands of China, not Pakistan. This would mean, that it would not be until 2025, before Pakistan Air Force starts recieving it's first Stealth Aircraft ever. That is more than a decade away, where as the J-10 has been in production for almost a decade. The J-10B will be available for Pakistan Air Force, once the necessary paper-work has been completed. J-10B is the requirement of Pakistan Air Force, now ..... not 11 years down the line. We see before our very eyes that the enemy (hindustan) has already inducted nearly 200 Su-30 Flankers and is gearing up to go ahead with the production/induction of Dassault Rafales. The projected number of Rafales is estimated around the 200 mark as well. For this reason alone, it would be foolish on part of Pakistan Air Force's leadership to think that J-10Bs are useless and that F-16s can do the job in the mean time while they wait for the J-31s. J-10B allows Pakistan Air Force to restructure it's combat-fleet with 3 top-notch fighters, JF-17 Thunder, J-10B Vigorous Dragon and F-16 Fighting Falcon. And that this combat fleet be focused on the enemy (hindustan) and not on cockroaches like the TTP. If I were to advise Pakistan Air Force, then I would say to them that you are junking your primary weapons platfoms on TTP. This is exactly what the enemy would want us to do, that we use F-16s, JF-17s, dropping bombs on elusive targets. When these combat platforms ought to be used against any future war against ANY enemy who attempts to challenge the sovereignty of Pakistan. Instead of getting dragged into using up the valuable combat assets on fighting against insects. It would be better that you send your own wasps to kill these insects. In other words, get UCAVs, that can loiter in a target area for hours, if not days. That have a significantly low operational cost, when compared to using JF-17s, J-10Bs and F-16s. I would advise Pakistan Air Force's leadership to invest in high performance surveillance drones which have greater endurance, precision sensors to locate and identify threats. This is the only type of unmanned platform, which is crucial along with combat-drones, to exterminating the TTP/AQ/BLA threat. And that would free up your Combat-Fleet for the real war (if it were to come), with a real enemy who has a military. And for that real war, which perhaps wouldn't really send a memo to us saying that we're coming, can occur way before Pakistan Air Force takes delivery of it's first Gen-5 Stealth fighters. You're right, there will have to be structural changes in the cone area for the AESA radar. The magazine wasn't Air-Combat, but Combat Aircraft. How is J-10B in comparison to Rafale and Su-30MKI ? China has conducted DACT and Aggressor air-exercises in the past. In which they've pitted their J-10As against Shenyang's J-11As. The results were resoundingly in favor of J-10As. Similar DACT sessions were with Su-30MKs, which also proved J-10As as worthy adversary. One could only percieve that this is among other things, is the reason why they pursued the development of J-10Bs and J-11Bs. Both aircraft are to have AESA radars. Funds my friend. On this forum you will see the members talking about we will get this we will get that but how? Money makes the mare go. If we can't afford to induct only 36 J-10 Bs then how can we generate the money for the 5th generation aircraft? It is a fact that PAC karma is not getting enough electricity to run the production lines of JF-17s. The maintenance cost of twin-engined j-31 will shake the PAF's budget. Pakistan doesn't have the money, but it has the resources. Pakistan completely dropped the ball in its relationship with China. While many Pakistanis (including some generals and air marshals) wanted to build genuinely strong political ties with China, our sellout and/or indifferent rulers (fauji and civilian) kept edging in favour of the US. Today's Pakistan is willing to lie down and take India's Indus Water Treaty violations, i.e. today's Pakistan can't even defend its own vital interests, how can it be expected to even help China? Put another way, if Pakistan actually became an independent state with its own interests and its own objectives, you'll see China cut Pakistan a break in terms of military hardware, money, trade, etc. A neutral Pakistan is much more valuable to China than a dodgy Pakistan run by weak pro-US rulers. We're not there yet, unfortunately. chinese have made considerable advances in the last decade , yet still, by the most reasonable estimates, they are around 3-5 years behind US and west ( the gap is closing though ) in leading edge R &D etc. having said that, the bulk of Pakistani defence procurement has been made from china in the last 15 years, F 22 frigates, fighters, tanks etc to name a few and they seem to be performing reliably. on a second note, Pakistani military knows and is well aware of the fact that ties with the US will gradually reduce over time when chinese alternatives to established US systems are available ( COMPASS navigation system , AESA radars and capable front line fighters ) . the PA is also wary of the fact that its is a target of major spy activity by the CIA and NSA and is taking all the safe guards to reduce dependence on US systems . case in point is tactical military radios that were supplied by US and were later found to be bugged. same goes for F 16s, which no matter how much the PAF denies, are bugged in some way . the chinese have, no doubt ,also benefited from the US arsenal of PA, having studied the performance parameters / design areas of many systems to help in their own projects . I visited PAC Kamra's AMF yesterday and inquired about the JF-17 Block 2. They say there aren't any particular changes in the block besides the indigization of many of the small components. I also saw a JF-17 (serial 147 or 148) with an IFR probe. It is the fixed kind found on the mirages. It was being installed. I was also told that the previous aircraft will be fitted with this too. 40 JF-17s are with the PAF while the final 10 from the first block are at Kamra undergoing the delivery trial runs. Also, there is little desire to switch to a Chinese engine while the KLJ-7 has been retained for block 2. WS-13 is not ready at the moment, hence our apprehensions. That engine lacks the initial thrust and has a tendency to stall. KLJ-7 is identical to the Zhuk that were on Mig-29s. Indian Migs had the Zhuk-ME. With the JF-17, every time we made changes and additions the aircraft would go back and get those additions incorporated. They still remained Block-I. Block-II will too go through changes as and when we procure better equipment, but the title will remain Block-II. 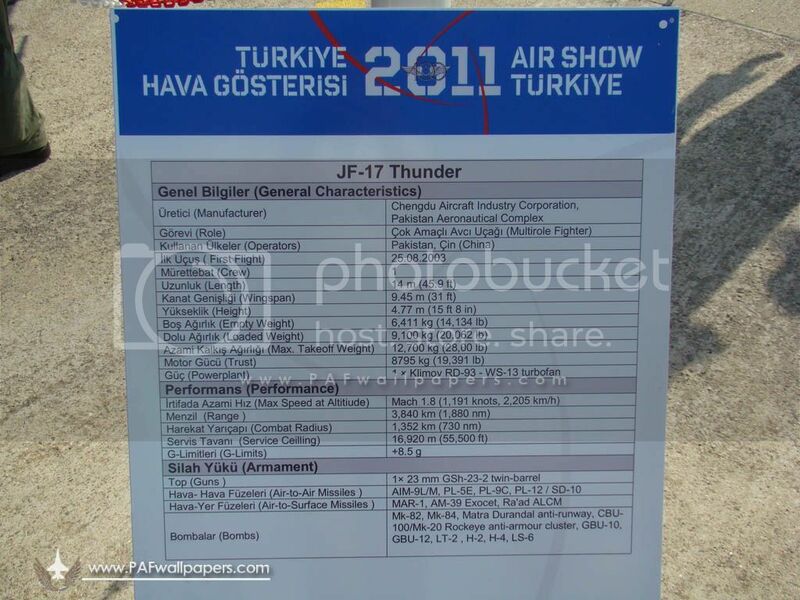 The image below is from the air show in Turkey; notice the armaments. All of them were incorporated on the Block-I, one by one. We bought the Brazilian missiles long after we decided to manufacture the JF, hence it wasn't even in the planning to begin with. Edited by Felicius, 17 April 2014 - 08:44 AM.